Heinrich Miller was one of the most important Pennsylvania German printers of his time. He is also one of the most eccentric, footloose, and well-documented German-American / Moravian printers of his era. Heinrich printed the first item printed in Lancaster City in book form: an 11-page German-language pamphlet titled Circular-Schreiben der Vereinigten Reformirten Prediger in Pennsylvanien... (Circular Letter of the United Reformed Preachers in Pennsylvania...) He printed this in 1752 with his business partners Ben Franklin and Samuel Holland. Heinrich printed Lancaster's first significant newspaper, Die Lancasterische Zeitung (The Lancater Gazette.) ...also printed in 1752 with his business partners Ben Franklin and Samuel Holland. Later, Heinrich's Philadelphia newspaper ( Pennsylvanischer Staatsbote) was the first newspaper to announce the Declaration of Independence ...on July 5, 1776. Four days later, Heinrich published a German-language edition of the Declaration of Independece in his Staatsbote newspaper. 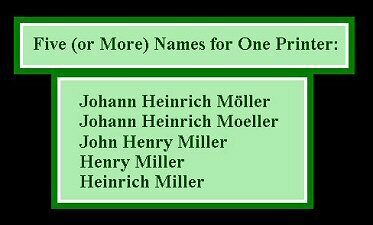 Johann Heinrich Moeller (or Heinrich Miller as he usually wrote his name) was born in 1702 in the Waldeck region of Germany. Finally, in the early 1760s, his journeyman years were over, and he became one of Philadelphia's greatest printers. An excellent 1916 biography of Heinrich Miller is in the "German American Annals" Here.